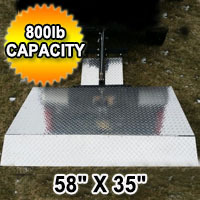 Purchase Your Brand New High Quality Heavy Duty Vehicle Hitch Lift Gate - 800 lb Capacity Today! Limited Quantities Available! Call 1-866-606-3991. Purchase Your Brand New High Quality Heavy Duty Vehicle Hitch Lift Gate - 1200 lb Capacity Today! Limited Quantities Available! Call 1-866-606-3991. Purchase Your Brand New High Quality Heavy Duty Vehicle Hitch Lift Gate - 1500 lb Capacity Today! Limited Quantities Available! Call 1-866-606-3991.